Bane or boon? Website redesigns can do more harm than good. 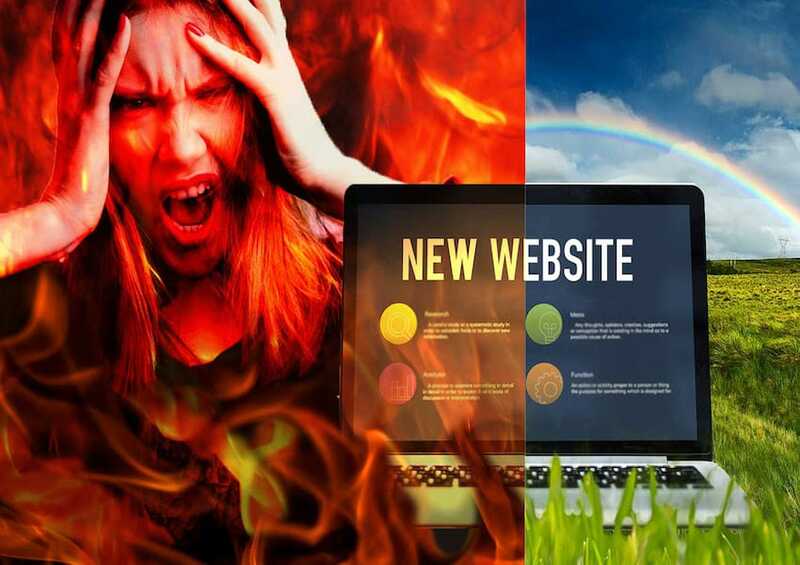 It’s little known that in early drafts of Inferno, Dante had envisioned a 10th ring of Hell, where marketers were damned to eternally undertake a corporate website redesign. If that barely sounds like hyperbole to you, know you’re among friends. We meet a lot of our clients when they are in the process of a website redesign, and the stress of it all is palpable. Even if the design is perfect, even if the new features are killer, and even if the CEO is ecstatic, there’s that gnawing feeling that it all could go wrong with, essentially, the flip of the switch. And, not to be a downer, but we’ve seen that happen, too. We’ve seen the websites of local, national, even international corporations tank in rankings just because of a seemingly small development oversight. They come to us after the launch, wondering what happened—where’d all the traffic go? It’s usually pretty easy for us to show them, and actually would have been pretty easy to prevent, if we had been part of the process. Unfortunately, it’s much harder to repair after the fact. Over the next few months, we’ll be sharing our tips for avoiding digital marketing disaster with your next website redesign. We’ll explain the steps you need to take before, during, and after a relaunch to ensure any detriment to your rankings, traffic, and conversions is mitigated, and your new website is primed for success. We’ll also provide helpful downloadable checklists for each phase of the redesign process. Recently, our experts were asked to weigh in on a website that was only weeks away from relaunch. Our process for evaluating any website involves a very thorough Website Redesign Audit. In this case, we were able to evaluate both the existing website, as well as the un-launched redesign. While it’s unfortunate we were brought in so late in the process, it turned out to be extremely fortunate that we were brought in at all. We discovered several oversights that would have significantly affected traffic if the new site had been launched, as is. There was a real possibility that years of successful SEO and content generation could have been undone, virtually overnight. At this late stage in a website redesign, we know it’s pretty inconvenient to have to go back and unfix things that (surprise!) weren’t broken in the first place. However, it can take months, even years, to regain previous levels of traffic and rankings after a flawed relaunch. And the cost and effort behind that is significantly greater. All that effort would have been put to much better use building on past SEO successes, rather than having to regain lost ground. In another instance, our team audited a redesign project for large, multinational company. Even though our recommendations were straightforward and accepted by the client, layers of corporate approval meant the brakes could not be applied. Since the relaunch, the site has predictably suffered a big hit in organic keyword rankings (and traffic and leads, as a result). Fortunately, the company’s widespread brand recognition helps carry them through, and we continue to work with them to patch up the damage and rebuild their organic visibility. In reality, relaunching a website with such significant optimization flaws is not a risk most businesses can take. Especially those whose brands aren’t a household name. If you are making money from your website—whether directly, through ecommerce and online sales, or indirectly, through lead generation—you simply cannot risk losing a sizable chunk of your traffic virtually overnight. Are website redesigns really necessary? Every year, we see quite a few unnecessary redesigns—at least from our perspective. When you look at search engine visibility, most of the websites we audit don’t need a full redesign to improve their rankings and traffic. However, from an aesthetic, functionality, and usability standpoint, it’s an entirely different story. The idea that websites need a complete overhaul every two or three years is ingrained in the minds of marketers. But modern content management systems, such as WordPress and Drupal, provide a much more appealing and effective option: an iterative design approach. This is how software is developed, and for good reason. By updating your website in planned phases, rather than redesigning the whole thing at once, you prevent the possibility of completely tossing out what’s working. You can still refresh the design or launch entirely new functionality, but the emphasis is on doing so in regular, incremental updates. It may take more forethought, but a more iterative approach is ideal for many practical reasons, including maintaining and growing your digital visibility. That doesn’t mean a complete website redesign should never happen. Sometimes there is no choice, especially when undertaking an effort such as a company rebranding or migrating to a new content management platform. Just know that when a full website redesign is required, it doesn’t need to be at the stake of your online visibility. It is possible to prevent nearly any hiccup in your traffic by having a comprehensive SEO plan in place to guide the redesign and relaunch process. If your company is seriously planning to undergo a website redesign in the coming year, or (gasp) may have already started the process, do yourself a favor and have your existing website audited. The earlier the better, but it’s never too late to prevent an SEO-pocalypse. An audit will allow you to evaluate how well your existing website is performing based on organic visibility, content performance, and traffic behavior. That information should be your guide as to what to keep, what to toss, and what to polish up for the new site. Our own Website Redesign Audit analyzes hundreds of digital visibility checkpoints. This includes not only your website, its content, traffic, and optimization, but also off-site elements such as backlinks. We use industry-standard tools to collect the data, then our experts piece it all together to create a full picture of your digital visibility. Our process is extremely thorough and our report includes lots of human analysis to tell you exactly what it all means, as well as prioritized checklists to help you get it all done. We are there to support your team as your new website is developed, and perform pre-launch checks of your code and content, to ensure everything is in place for launch day. But, there are lots of other options at your disposal for undergoing a less-comprehensive audit, or even performing a DIY version. The bottom line is, for the sake of your digital visibility, some level of audit should be a standard precursor to any redesign project. The modern website redesign process may feel like some sort of diabolical, slow-motion treadmill. Every few years you’re right back where you started, and no matter what you do, you still don’t seem to be getting anywhere new. The denizens of the 10th ring of Hell would probably agree—it’s time to break the cycle! Don’t just redesign because you are “supposed” to. Make sure you do it for the right reasons, that the new website is set up for success, and that it does not leave out the elements from your current website that are driving your visibility. 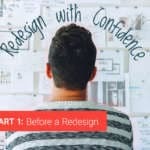 As part of our Redesign with Confidence series, we’ll be sharing more tips for making your next website redesign project a success. It all begins early in the process, by auditing your current website and using that information to guide your redesign decisions. Next month we’ll explain the steps you need to take before a website relaunch to safeguard your digital visibility (including a handy checklist to download). Sign up for our monthly newsletter to get more great digital marketing tips, directly to your inbox. Learn more about our Website Redesign Audit. As our one-woman marketing team, Cathy designs, writes, creates, and manages everything around the Pure Visibility brand. She is also the proud inventor of the asterbang.